I recently came across Java phasers while reviewing different constructs for inter-thread communication. Phasers are associated to the concepts of fuzzy barriers and point to point synchronisation which are all well explained on this parallel programming course. 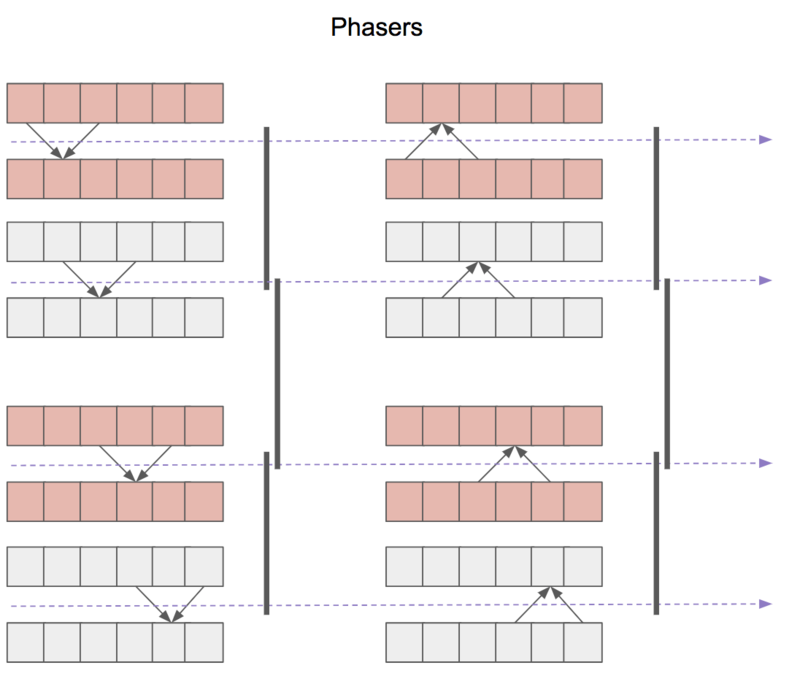 As to this post, I will borrow the example of the one-dimensional stencil to explain very intuitively the motivation behind the concept of phaser. In order to justify the need for phasers, we will start by demonstrating the use of other synchronisation constructs to solve the computational problem of the one-dimensional stencil. In other words, the value of the first and last elements is fixed (these values do not need to be the same though), whereas the value of each of the remaining N-2 elements is the average of the value of its neighbours. This is a recursive process: as the value of its neighbours change, each element needs to re-compute its own value. Ideally, after a few iterations, the value of all the elements should converge and the recursive iterations stop. Just a brief digression for those curious about Physics: the aforementioned Wikipedia link says that “stencil codes are most commonly found in the codes of computer simulations”. No wonder! You can picture the one-dimensional stencil as a metal bar connected to a heat source by its sides. The temperature of the sides remains constant whereas the temperature along the bar changes over time until reaching thermal equilibrium. To get some intuition about the stencil problem, let’s work through an example. To make it simple, consider an array of length 4 whose first and last elements have a fixed value 1. The remaining elements have an initial value 2. Therefore, the initial array is [1,2,2,1]. 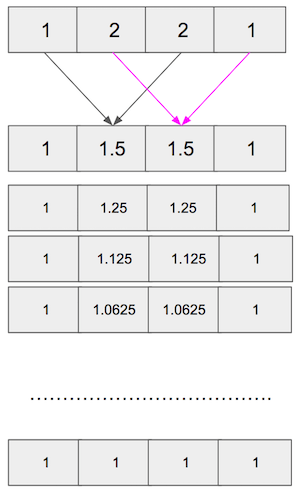 After the first iteration, the array becomes [1,1.5,1.5,1]. The following diagram shows how the values change on each iteration and how, eventually, the values converge to 1. Working on top of the sequential solution, this section describes other approaches to solve the problem using different parallel-programming constructs: Latch, Cyclic Barrier and Phasers. From the definition of CyclicBarrier, a cyclic barrier is “A synchronization aid that allows a set of threads to all wait for each other to reach a common barrier point”. at the end of each iteration, each thread awaits at the barrier until all other threads reach it. Phasers allow to reduce the synchronisation contention cost when there is a large number of parties. 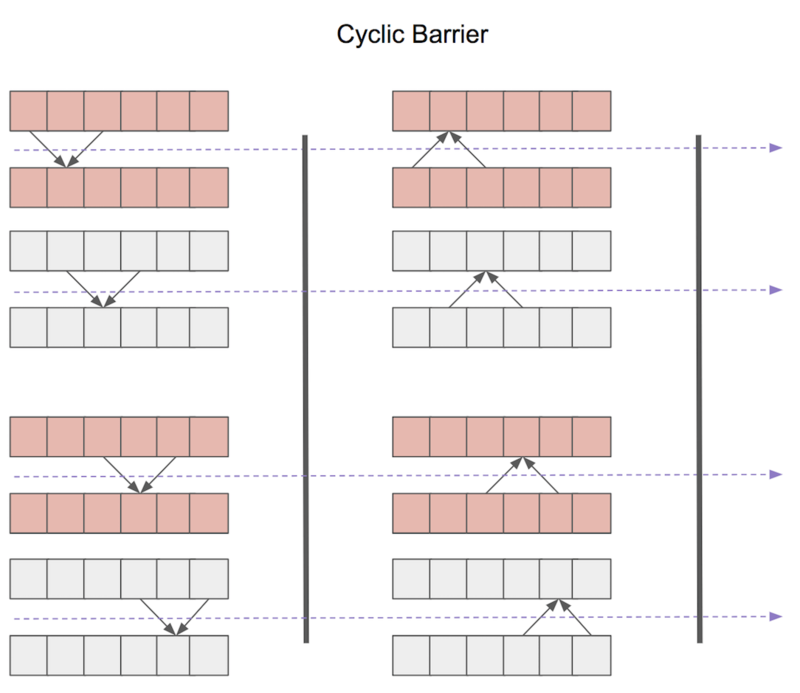 In order to understand this, let’s revisit the cyclic barrier example: we said that “before moving on to a new iteration, each task needs to wait for all others to complete” and as a consequence there is a common barrier for all threads. Well, the above statement is not completely true. Strictly speaking, each task needs to wait only for the adjacent tasks that compute the value of its neighbours. Therefore, the situation is better described by the following diagram, where each thread shares a barrier with the adjacent ones. This fine-grained synchronisation is achieved through the use of phasers. The implementation details can be found on the source code. 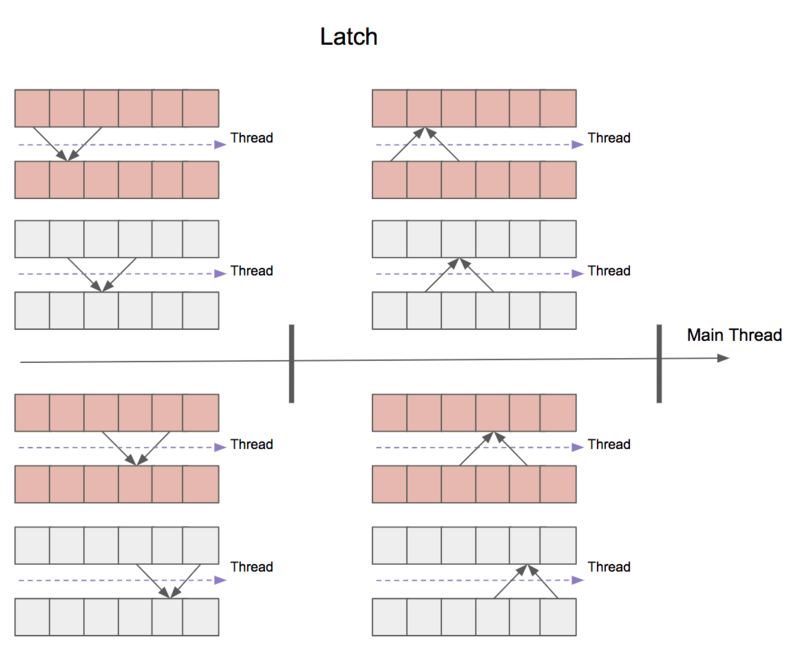 And even if it were possible to create so many threads, the operating system would struggle to handle them all with a limited amount of CPUs. In order to get around this issue, the elements of the array can be grouped and then create a task for each group. Each task will calculate the values of all the elements of that group in a sequential fashion and the creation and synchronisation of barriers will happen at group level. This is called Phasers with split-phase barrier or fuzzy barrier . 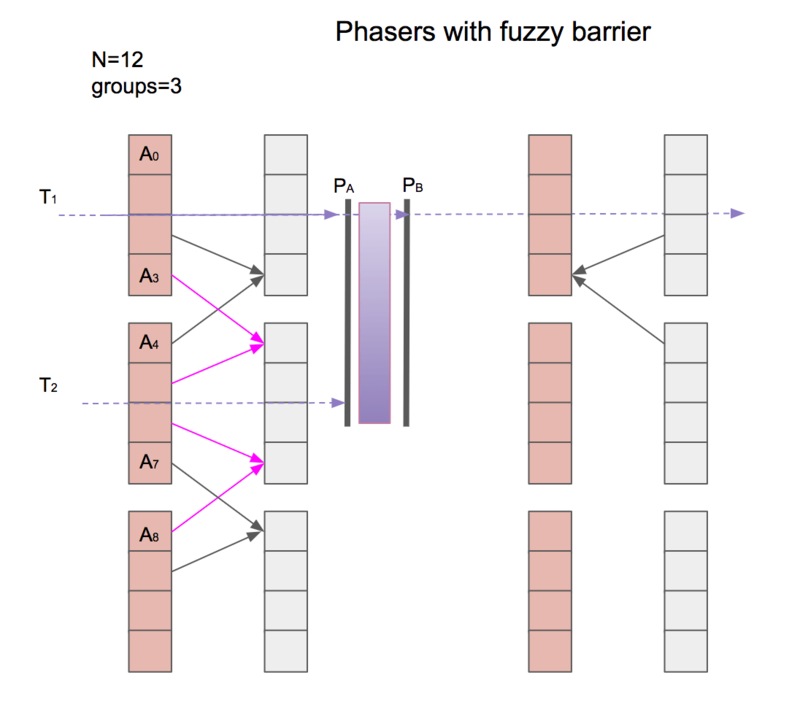 This capability to perform local work within the barrier is another of the main characteristic of the phasers together with the capability to make fine-grained synchronisation. The following diagram illustrates the idea of fuzzy barrier. The diagram represents a 12-element array divided in 3 groups of 4 elements. To keep things simple, we will focus on the barrier shared by the first and second groups. Each thread Tx calculates the value of all elements in that group, starting with the values on the sides. For instance, T1 calculates A3, reaches PA and signals it out to the other threads. Then it proceeds to calculate the rest of the elements in the group and, when it is done, waits on PB until T2 reaches PA. When T2 has calculated A4 and A7, it reaches PA and emits the corresponding signal. At this point, T1 can progress to phase 2 while T2 completes phase 1 by calculating the rest of the elements of its group, and so on. The section “A final twist: fuzzy barriers” really helped me understand the point of separating arrive() and awaitAdvance(). Thanks for that!